Let us deliver the ultimate experience for your team. Best of all, you don't have to leave the CBD. 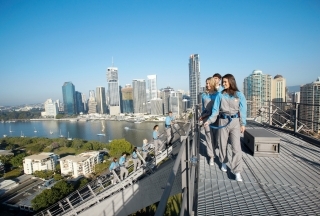 Story Bridge Adventure Climb caters for groups of all sizes, from the ultimate downtown team building urban adventure to tailored smaller team packages, we can provide the ultimate experience for your next event. Best team building activity in town. Get a great price for group bookings. Venue hire for up to 140 people. We offer a new range of outdoor team building activities and urban adventures ranging from 1.5 hours through to half and full day activities spanning multiple venues. From canapés on the bridge to our new world exclusive Climb & Abseil, there’s no end to the adventures available. 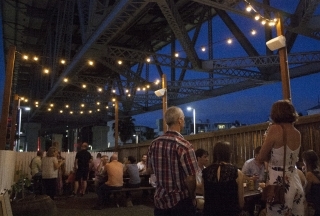 Free venue hire – choose from our new Bridge Courtyard or Base Camp. For the ultimate team building event, corporate team day, or special event we can customise a package that will inspire and excite all your team members. With our Bridge Courtyard and Base Camp venues, Story Bridge Adventure Climb is the best option for your Team Building Activity. Take your team on a group climb and then round out the experience with one of our Team Building event packages. For the ultimate team building event, corporate team day, or special event we can customize a package that will inspire and excite all your team members. Spots are always limited as we only have 1 Bridge so enquire now!